In the 1880’s the railway line to Ringwood opened and this lead to an increase in the settlement of pioneers in the Vermont region. They cleared the heavily timbered country and planted vines, fruit trees and established market gardens. A school was already flourishing and there were plans for a church. 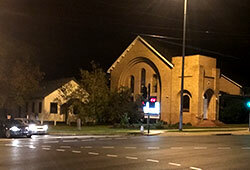 However, it wasn’t until early in 1907 that construction commenced of a timber church building on the corner of Canterbury and Mitcham Roads. It was named St. Luke’s and was able to accommodate 120 people when it was dedicated in September that year. 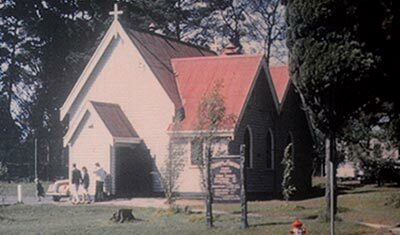 St. Luke’s formed part of the Upper Ferntree Gully church district and many clergy rode a horse to Vermont to conduct services. But mostly they were led by laypeople from the congregation. It wasn’t until 1920 that the Rev. Thomas McKeon was inducted as the first Vicar of St. Luke’s. The church grew rapidly after that time and by 1922 an extension to the building was needed to accommodate the growing membership. Thomas McKeon died in 1923 leaving a widow and two children. The people of the Parish built a home for them in Francis Avenue and then two years later they once again used their skills to build the parish hall naming it McKeon Hall. Land was also purchased to build a vicarage next to the church property on the corner of Grove Street. As the Sunday School numbers were growing rapidly in the mid-1930’s an addition was built onto McKeon Hall. A vicarage was built on the corner site in 1940 and a Kindergarten building completed in 1956. By the late 1950’s the congregation had outgrown the original church and the building was moved to the rear of the property to make way for the then new, now current St. Luke’s Peace Memorial Church. The foundation stone was laid in October 1961 and the building dedicated in May the following year. A new vicarage was built in 1985 on the former church tennis court fronting Grove Street. Our Centenary was celebrated in 2007. Further work to improve car parking and traffic flow on the church property is in the advanced planning stage along with a major upgrade to the church’s toilet facilities. Throughout its history St. Luke’s, the ‘Church on the hill’, has endeavoured to serve God and the community by bringing the Good News of Jesus Christ to Vermont and its surrounds. There have been challenges, and there always will be, but St. Luke’s has always been upheld by the power of the Holy Spirit and will continue to be. A new era began in November 2016 with the forming of our partnership with St Alfred’s Anglican Church, Blackburn North. We look forward with anticipation as God leads us!